After learning how to make a cobbler with my own experimenting on the nectarine cobbler last summer, I realized that cobblers are awesome precisely because they are the "casserole" of the baking world. Well, at least, that's how I see it. I mean, you just mix a bunch of ingredients and dump them into a pan without stirring. They're just laid out in sorts of "layers" and popped into the oven. Anyway, this was created because my mom told me my dad had bought way too many cherries so they needed to be used/eaten before going bad. Cobbler-in' time, I thought! 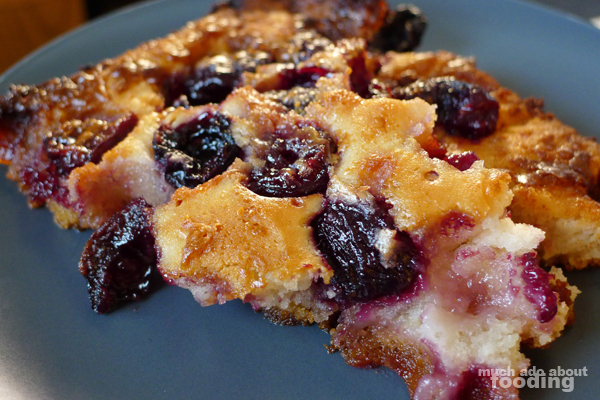 So this recipe is to account for the natural sweetness of the cherries themselves - many other cherry cobbler recipes call for tart/sour cherries but I used black ones in mine and thus had to reduce additional sugar additions. In a 9"x13" pan, lay out your butter in even segments. Pre-heat oven to 375°F and place pan inside to melt the butter. In a separate container, sift together 1 cup of flour, 3/4 cup of sugar, and 1 tsp of baking powder. Once that's done, add in the 1 cup of milk and stir until smooth. 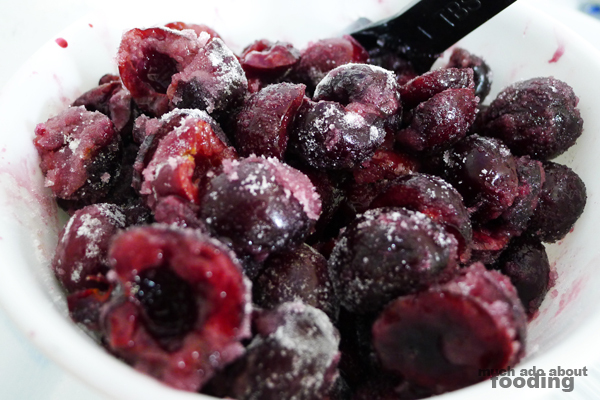 In a separate bowl, mix cherries with 1 tbsp of flour and 1/2 cup of sugar. Once the butter has melted, remove from the oven. Pour in the batter evenly in the pan but do not stir inside. Then plop down the cherries in evenly spread apart sections - do not stir. Put back in the oven for 50-60 minutes (err on the side of less), and then enjoy!